Wet scrubbers are effective air pollution control devices for removing particles and/or gases from fume hood exhaust streams. 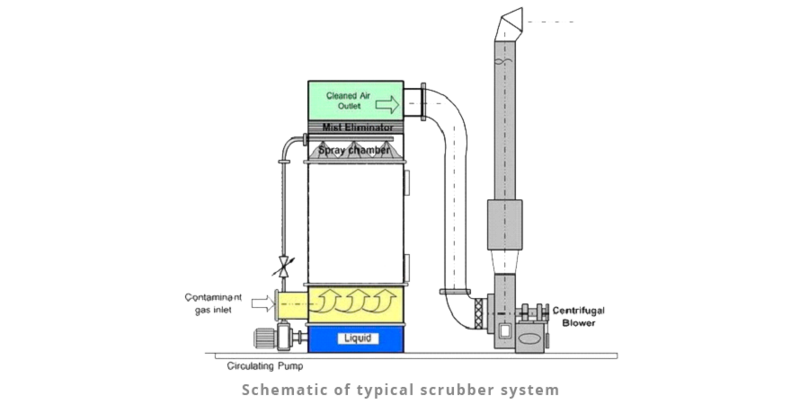 A wet scrubber operates by introducing the dirty gas stream with a scrubbing liquid typically water. Scrubbers are commonly used in laboratory applications to eliminate potentially harmful fumes, gases and pollutants. A liquid, in general water may added with active chemicals adapted to the process, is sprayed in to the air flow. Aerosol and gaseous pollutants in the air stream are removed by either absorption or chemical reactions with the water solution. Scrubbers are made up of PP+FRP material, which provides great strength as well as high rigidity. Water storage tank underneath having connections for fresh water entry, water overflow, pump connection & drain. A centrifugal pump to circulate the water. Packing bed to increase the purity of air by mixing with water for longer time. (Optional) Air sampling port to check the air quality of exhaust air periodically. Scrubbers are usually installed before the centrifugal exhaust blower i.e. at negative pressure side. The centrifugal pump circulates the water with chemicals and sprays with high pressure through nozzles into the exhaust air flow from upper side. 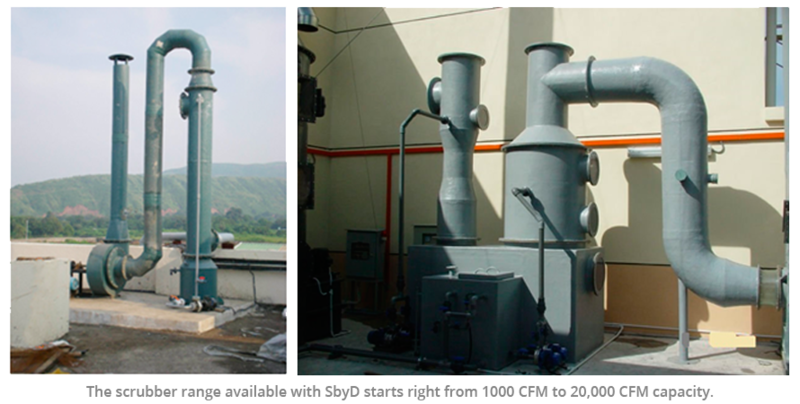 The sprayed water mixes with fumes / gases, neutralizes them and again gets collected in the reservoir, resulting in the exhaust of environment friendly air without any harmful fumes / gases. Water droplets are separated from the exhaust and re-circulated back to the water reservoir. Dust, pollution products, sediments if any mixed with water is removed periodically through the drain. The drain can also be connected to ETP plant.